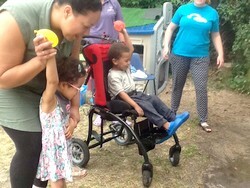 Our playgroup is for children up to the age of 5 with special needs. We are registered to take up to 24 children per session, although we limit sessions to a maximum of 20 to maintain high standards of provision. By its very nature, a playgroup is usually the first educational setting attended by children. At MOP, our highly-staffed and caring setting encourages an environment where children are able to experience a wide range of activities aimed at encouraging basic life skills and independence; thus building confidence and self-esteem. It is acknowledged that pre-school education is vital in playing the part of preparation into school life, and we play a vital role in this all-important start to their education despite their additional needs. Our children progress to their next educational setting, in either a special or mainstream school, having had the benefit of a pre-school education which incorporates the necessary additional support in order for them to learn successfully. Under 3: £15 per session. Some 2 year old children may be eligible for funding. This Bucks CC Poster (link) gives a summary and there is more information at www.buckscc.gov.uk/education/early-years-and-childcare. Over 3 years old: children are eligible for funding from Bucks County Council with effect from the term after their third birthday.